When you need a Dallas garage door repair company, you don’t want to simply choose the first one you see when either conducting an Internet search or thumbing through the phone book – yes, those still exist. Your garage door is an extremely important piece of protection, to both your vehicle and any items you are storing. As a result, you want to make sure your repair is performed correctly by a trained and qualified professional. Action Garage Door would like to help you make the most well informed choice possible. You should do a little research before you make your choice on a Dallas garage door repair company. But there’s no need to dread having to put in the work; it won’t take nearly as much time as you may think. Here are a few tips to make your search easier. Talk to at least three companies so that you can comparison shop. This will give you an idea of the different pricing that is available, and also give you a better idea of what kind of work may need to be performed. Get references from each company, as well as contact information. Talk to those former customers so you can get a firsthand idea of their experiences. Keep in mind that the lowest price doesn’t necessarily mean the best service. Look at some Internet review sites to see what other people are saying about the companies you are considering. At Action Garage Door, we have provided Dallas garage door repair for 30 years. Our company is accredited by the Better Business Bureau and our top priorities are making sure our customers are not just satisfied, but completely safe as well. If you would like to learn more or schedule an appointment for service, contact us online or call us at 972-215-7906. 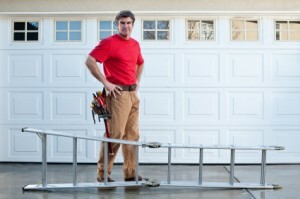 What do you look for in a garage door repair company? Let us know by clicking one of the social media buttons on this page.